Best Microwave Rice Cooker - What's Goin' On In The Kitchen? To make it easier for you to find the best microwave rice cooker, I've written this post to show you which one I use and why. You can also see some of the other microwave rice cookers out there that I think are worth the money. So what is the best microwave rice cooker? I use the Joseph Joseph 45002 M-Cuisine Microwave Rice Cooker. It comes with a 2-litre cooking pot, colander, rice cup and rice paddle. It is very compact and super easy to use. The rice paddle can also be used to lock the lid tightly, and to act as carrying handles for the rice cooker. My short answer above shows you which microwave rice cooker I choose to use in my kitchen and why. 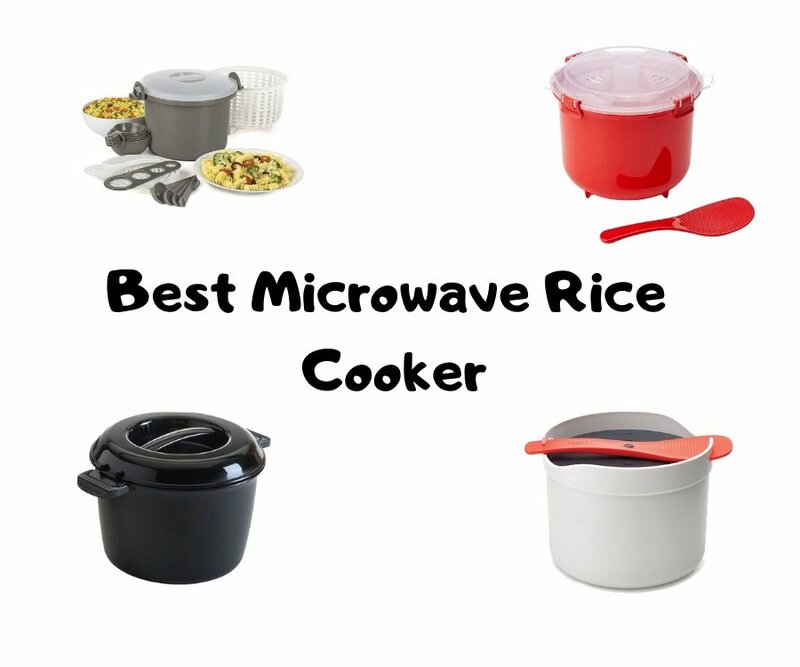 I wanted to provide more detail than just looking at one microwave rice cooker, so I've added some information below about my own choice, and another three microwave rice cookers that you might also want to take a look at. What Is The Best Microwave Rice Cooker? Saying which microwave rice cooker is the best is really a personal opinion. Different people are always looking for different things in their kitchen. Some people may want a small and compact rice cooker to cook rice for just one person. Other people may need one for the whole family. Again some people may want a microwave rice cooker for just cooking rice alone. Other people may be searching for a microwave rice cooker that can also cook other things too such as pasta or vegetables. I've tried to provide some good examples of microwave rice cookers of varying sizes and with a range of different accessories. Take a look at each of these before you decide which one to buy. This Joseph Joseph rice cooker is my favorite microwave rice cooker. It is super easy to use, and the functionality of it is great too. This rice cooker comes with a 2-litre cooking pot, colander, measuring cup and rice paddle. It also comes with comprehensive instructions on exactly how to cook a variety of types of rice. The handy rice paddle that comes with this clips on top of the rice cooker, as you can see in the picture above. It serves as a really handy and sturdy carrying handle for the rice cooker. The rice paddle is also ideal for fluffing and serving your rice once it's cooked. Everything that comes with this rice cooker can be stored inside, with the exception of the handle which locks in place on top. This means that the rice cooker can be stored away neatly in the smallest of kitchen cupboards. Cleaning up once you've used this microwave rice cooker couldn't be easier. Everything that comes with this set is dishwasher safe, so as soon as you've used it, just stick it in the dishwasher and you're all set. If you don't have a dishwasher, this product is also super easily to clean with washing up liquid and water. Try to do this sooner rather than later so that the rice does not stick to the inside of the pot though. In terms of size, this microwave rice cooker is 8.7 x 5.3 x 7.1 inches. The actual item weight is 1.18 pounds, and the shipping weight is 1.72 pounds. The 2-litre cooking pot can make approximately 2 cups of uncooked white rice, which will make approximately 4 cups when cooked. This rice cooker can also be used for cooking oatmeal and other types of grains, as well as all varieties of rice.Cooking times for each of these vary, and using the instructions supplied will help out with this. I'm afraid it's just trial and error until you find the right cooking time for each type and amount of rice. I will say it's much quicker than using a conventional plug in rice cooker though. This reason I think this is the best microwave rice cooker is because of it's ease of use and super cheap price. Thera are a ton of reviews on Amazon that back up what I found, and you can read them here. This is considered by many to be the best microwave rice cooker, and at the time of writing this it is currently a best seller on Amazon. I genuinely love Sistema products, and have several of their handy storage containers for taking a variety of foods in to work for lunch. The clip technology used on these products is the best I've found for keeping containers locked and food fresh. This microwave rice cooker uses these clips to keep the lid locked won. This rice cooker comes with a pressure chamber plate, 2.6-litre cooking pot, locking lid and a non-stick rice spoon. The pressure chamber plate that comes with this rice cooker is really handy. It collects any overflow during cooked to be collected and drained back into the base of the cooker. The lid on this is cool-to-touch, meaning that even after being in the microwave for several minutes, you won't burn your hand when touching this. The easy-lift clips on the side make this really easy to use. The lid also has steam-release vents which makes for complete splatter-free cooking. This rice cooker comes with a booklet that tells you exactly how much rice and water to put in for all different kinds of rice. Sistema has a great set of instructions online for the easy use of this rice cooker. This also includes a really great list of recipes for cooking all kinds of other types of food, all of which you can find here. Size wise, this rice cooker is 8.5 x 7.7 x 6.3 inches. The cooking pot is 2.6-litres, which is a little bigger than the Joseph Joseph rice cooker. This product is dishwasher safe, freezer safe and is stackable with other Sistema products for ease of storage. Like the Joseph Joseph rice cooker, this one by Sistema is super easy to clean. After cooking simply place on the top shelf of your dishwasher, or wash with warm soapy water straight after use. This was the rice cooker with the most reviews on Amazon, so if you are interested in seeing what other people have to say about this, take a look here. I've really included this in my list of best microwave rice cookers because of it's size. In comparison to the other rice cookers I've talked about, this one is fairly large. In terms of dimensions it is 9.5 x 6.5 x 8 inches and weighs 1.4 pounds. This rice cooker has a 3 quart cooking pot, which means it is capable of cooking up to 9 cups of rice. This rice cooker includes the base unit, an inner lid, a silicone ring, and then an outer locking lid. This outer locking lid will make sure your food stays warm if you wish to leave it there while you cook other foods. Cooking with this will prove to be a mess-free experience due to the double lid design of this rice cooker. As the food is cooked in this device, the water bubbles up through the small center hole, and then drains back down in the base of the rice cooker, ensuring no boil overs. If you are interested in using this for more than just rice, I found some great recipes here. Like the other cookers mentioned in my list of best microwave rice cookers, this one is also dishwasher safe. Once you have finished with it, simply place on the top shelf of your dishwasher, or wash straight after use with warm soapy water. To read some really useful user reviews of this product take a look here. I've included this in my best microwave rice cooker list because of the amount of accessories that come with it. While I feel it doesn't look quite as nice as the Joseph Joseph rice cooker (something that probably shouldn't matter, but does) the amount of accessories that come with it might make you want to get this for your kitchen. In terms of size, this is the biggest of the rice cookers I have looked at. It's dimensions are 10.8 x 6.5 x 9 inches, and has a 12-cup capacity, which will make up to 9 cups of rice.. This is most ideal if you are cooking for a lot of people regularly. Obviously the real selling point of this rice cooker is the amount of accessories you get with it. The measuring cups and spoons are perfect for measuring our just the right amount of both rice and pasta. The drainer that comes with this means it's really easy and convenient for cooking pasta with this rice cooker. As well as cooking rice and pasta, this can also be used for steaming a variety of vegetables, oatmeal and a variety of grains too. Like all of the rice cookers mentioned above, this one is also dishwasher safe. This will making cleaning up after you've made your rice, pasta or whatever else you choose to cook super easy and quick. There are lots of really positive reviews of this product, and it's not hard to see why at the time of writing this it is a bestseller on Amazon. To read the reviews take a look here. Who Is A Microwave Rice Cooker Good For? Why should you even bother buying a microwave rice cooker? I thought about this and came up with a few reasons why. Microwave rice cookers are way cheaper than their plug in electric counterparts. If I was going to choose between the two, I'd go with a microwave rice cooker all day long. They are capable of cooking rice just as well as their electric counterparts, and in many cases can do this much quicker. I think microwave rice cookers are ideal for people who want a rice cooker that won't break the bank. They are also good for someone who maybe has a small kitchen, or already has a number of appliances, and doesn't want another large appliance like an electric rice cooker taking up space in the kitchen. When I'm looking to buy kitchen appliances, I take a long time researching, looking at reviews and comparing several different factors. To be honest I don't see this as being as important when you are buying something cheaper like a microwave rice cooker. You do however still want to make sure you are getting the right rice cooker for your situation. Below is a list of things you may wish to consider before choosing which microwave rice cooker is best for you. I do have quite a small kitchen, so I always think about the size of products I buy to maximise the space. If you are cooking for one or two people, obviously you can look at a product that is smaller in size. I chose the Joseph Joseph rice cooker because I live alone, so don't need it to be huge, and it's compact and ideal for storage. I wouldn't buy a product like this these days if it was not BPA free. BPA stands for bisphenol A, which is an industrial chemical often used in the production of storage containers for food and drink. There have been several studies that show that this chemical can seep into food and drink over time, and I always avoid buying kitchen products if they are not BPA free. Sometimes when I'm looking at products for my kitchen, I like them to come with a range of accessories. This really depends on what I'm looking to get out of the product I buy. I went for the Joseph Joseph rice cooker because I liked the neat, compact nature of it, with the handy rice spoon carry handle. If you are looking for a more versatile product wth lots of accessories, you should think about the Prep Solution Slow cooker with it's wide range of these. Again when I buy a kitchen product I always think about how easy it will be to clean. All of the products mentioned above are dishwasher safe. Once they have been used it's as simple as placing them on the top shelf of the dishwasher and letting it to do all of the hard work. If you do not have a dishwasher, simple soap and water will be enough to clean these in seconds. I would do this soon after use to avoid the rice becoming congealed and sticking to the rice cooker. Summary - Which Is The Best Microwave Rice Cooker For You? As I've mentioned several times, I went for the Joseph Jospeh rice cooker because of it's size, ease of use and because I actually think it looks really cool. You need to look at the buying advice above to work out which one is best for you. If you want a large rice cooker, you might go for one of the bigger ones I looked at. If accessories are top of your list, or you want a more versatile rice cooker, you might go for the Prep Solutions rice cooker. Whatever you choose to go with I hope you enjoy using it to cook rice, pasta and a whole host of other things. Drop a comment below to let me know which microwave rice cooker you use, and what you have made with it. Can you microwave cooked rice? I really try to avoid doing this. Recooking rice will lose some of the nutrients, and just doesn't taste as good. It's also not too healthy to do this, so if you must reuse, cool the rice as quickly as possible and keep in the fridge. Recook within one day of the rice being cooked. Is brown rice healthier than white rice? In terms of nutrients, all rices contain carbohydrates but nothing much else such as protein or healthy fats. The difference between white and brown is that while white rice is pretty much entirely carbohydrates, brown rice is a whole grain, so is considered more healthy.